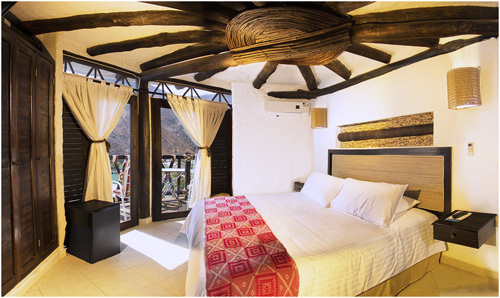 Ecohabs Taganga are an eco-tourist hotel in Playa Grande, Taganga, a beautiful beach with crystal waters and without toursit croed. It has been build in one of the side of a beautiful bay, with a totally ecological desing inspired by the bohíos of the Koguis, an ancient culture of Sierra Nevada of Santa Marta. Althought Playa Grande is outside Tayrona Park, it is here from where the park begin. 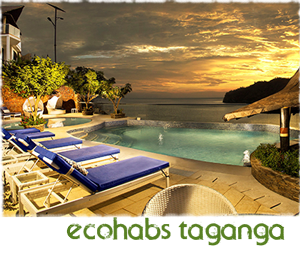 Ecohabs Taganga counts with 44 comfortable rooms with big balconys and beautiful views of the enviroment and suites with jacuzzi and solarium.It has one bar by the pool and an international restaurant, swimming pools, as well as several walking trails to walk around. 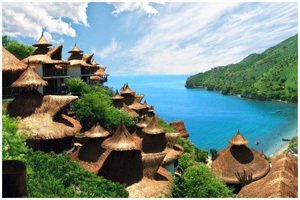 To get to Playa Grande, it's needed to take a boat from Taganga that takes only 5 minutes. It is a beautiful beach to enjoy the sunsets and practice diving. 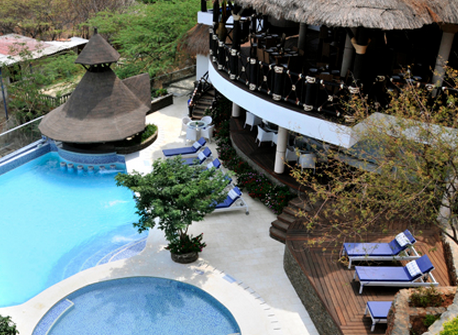 It is the perfect location to visit both Tayrona Park and the city of Santa Marta. Internet Wifi - Swimming pool - Two restaurants - Bar - Cable Tv - Fans - Air conditioning ̣̣(some rooms) - Direct access to the beach - Message services - Boat transport from Taganga - Transport service from Santa Marta. 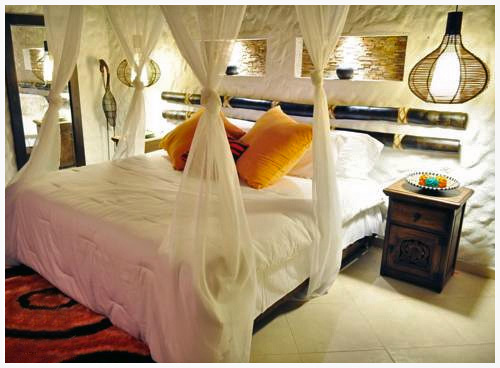 Ecohabs Taganga is located in Playa Grande, Taganga, one of the most special beaches of Santa Marta. You have to take the road to Taganga from Santa Marta. We can arrange your transport by private taxi. To get to the ecohabs you take a boat in Taganga beach, the way takes only 5 minutes.